Philadelphia teams have been tanking incompetently since before Sam Hinkie was alive. The 1968 Eagles started out 0-11 and looked like a lock to draft O.J. Simpson No. 1 overall. Then they won two straight to ensure that the Bills would have the top pick. In their 14th and final game that year, a young Frank Olivo emergency-dressed as Santa Claus at halftime, and was heavily booed and pelted with snowballs. An ISIS attack at an NFL game would receive less media coverage than this has. 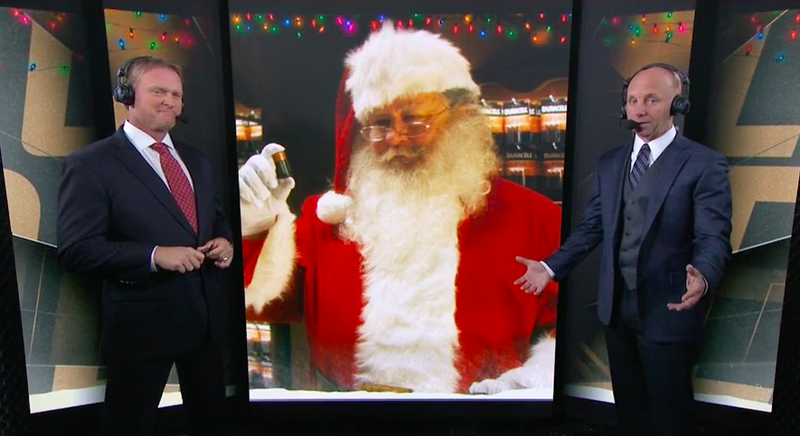 Santa was mentioned 46 times on last night’s ESPN broadcast of the miserable Raiders-Eagles game, 49 years later. After one of them, Jon Gruden offered a unique theory for why Eagles fans are so passionate that they would boo and assault Kris Kringle: The stadium is downtown, so it keeps weak and out-of-town fans away. Gruden: Gotta love these fans, they’re the best. And the stadium is right here in downtown Philly. Makes it even better. Gruden: You know, it’s funny Sean, I look at these NFC East teams. The Redskins, they don’t even play in Washington, D.C. They play in Maryland. The Dallas Cowboys, they play in Arlington, Texas. The New York Giants, we gotta go to Newark, I think, to watch them play. Philadelphia, you just open the door to your hotel, right downtown, we play. That’s why this place rocks with nothing but Eagle fans, and I love it.